Thomas Shepherd founded the town of Shepherdstown in 1734, long before West Virginia became a state. The town is the oldest community in the mountain state, and it has been carefully restored. Shepherdstown has largely avoided the turmoil of nearby Harpers Ferry and many of the buildings from the early 1800s still stand. Shepherd College, part of the state university system, is one of the largest employers in the town. It is located on the site of Fort Shepherd, a fortification used during the French and Indian War. The town is listed on the National Register of Historic Places, with 398 out of its 467 buildings having historical significance. 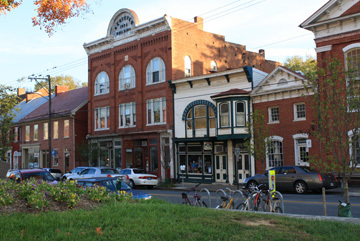 The Shepherdstown Historic District includes examples of Federal, Greek Revival, and Victorian architecture. Some of the houses are open to the public during an annual tour sponsored by the Potomac Shenandoah Garden Club in April. Contact the club at 304-876-2242 for details.